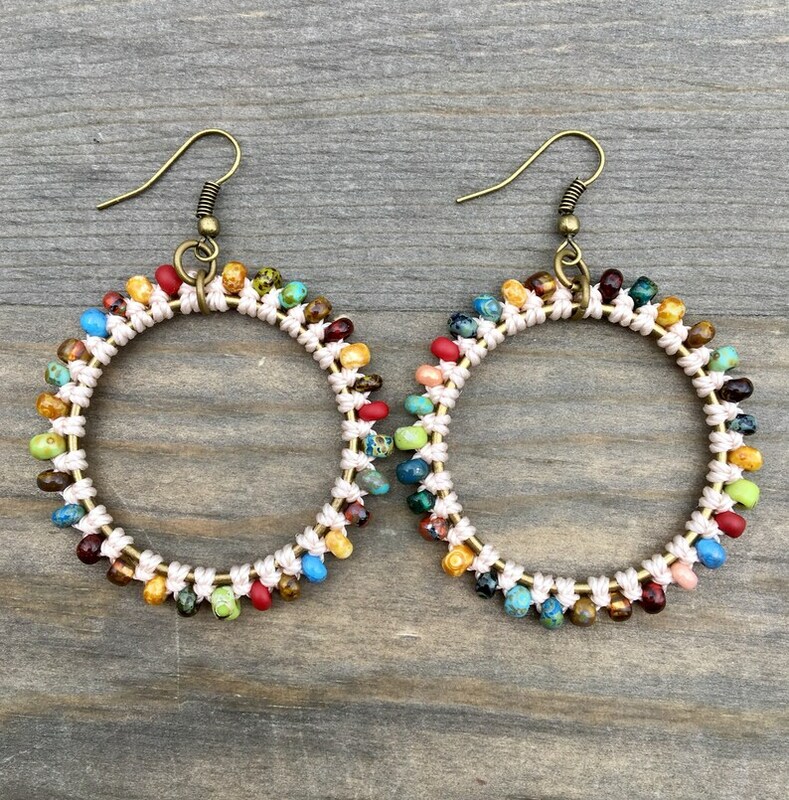 Beaded Hoop Earrings. Macrame Hoop Earrings. Knotted Earrings. Statement Earrings. These earrings were knotted with natural colored nylon cord and Czech glass Picasso seed beads. The perfect statement earrings without being too bold. ❤️ Lightweight to wear and have nickel free antique bronze findings and earring wires. ❤️ Size: One and three quarters inches wide and approximately two and a half inches in length. ❤️ Made with love in a smoke-free home! If you have a sensitivity to certain types of metal, make sure to check each listing to see what types of earring wires were used. Be sure to check out the rest of my micro-macrame jewelry in the shop! Teal and Coral Adjustable Bracelet Stack. Macrame Jewelry Set. Beaded Bracelets. Friendship Bracelets. Boutique Fashion. Summer Jewelry. Black and White Earrings. Beaded Hoop Earrings. Macrame Hoop Earrings. Knotted Earrings. Statement Earrings. Coral and Teal Earrings. Macrame Earrings. Knotted Earrings. Statement Earrings. Pink Macrame Earrings. Knotted Earrings. Macrame Earrings. Purple Earrings. Small Beaded Earrings. Knotted Earrings. Statement Earrings. Beaded Rose Pink Earrings. Small Beaded Earrings. Macrame Earrings. Knotted Earrings. Statement Earrings. Boutique Fashion. Beaded Teal Earrings. Small Beaded Earrings. Macrame Earrings. Knotted Earrings. Statement Earrings. Boutique Fashion. Macrame Chevron Earrings. Teal Chevron Earrings. Macrame Earrings. Small Beaded Earrings. Wine Colored Earrings. Macrame Earrings. Knotted Earrings. Purple Macrame Earrings. Small Beaded Earrings. Purple Beaded Earrings. Macrame Earrings.